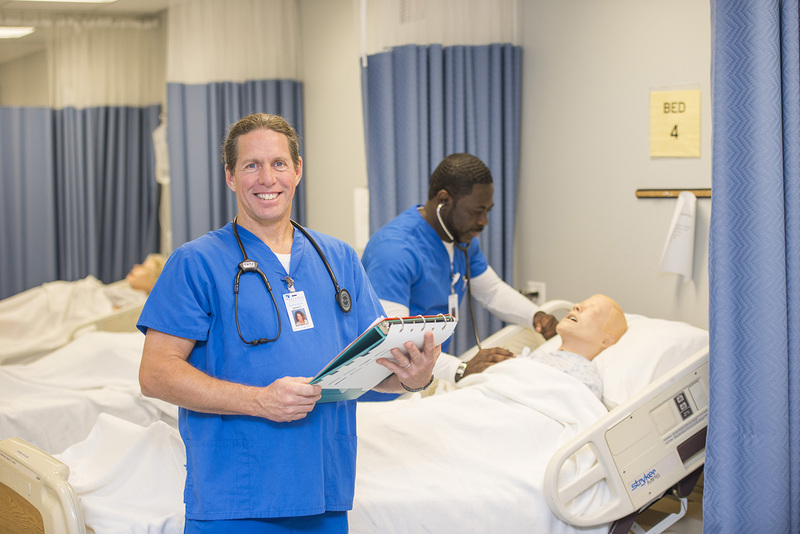 Kellogg Community College Nursing Program student Jim Pero was about as far away from Battle Creek as one can get and still be in Michigan when the seed for becoming a nurse was planted. Pero and his wife, Abigail, who works as a Nursing Program Specialist at KCC, were in Copper Harbor on the northern tip of the Upper Peninsula about to hit the trails for a mountain bike ride when he saw a truck covered in mountain biking stickers from locations across the country. When the owner of the truck approached, Pero struck up a conversation, asking how the man was able to travel to so many locations. The man said his girlfriend was a travel nurse, and they’d travel around the country from job to job as she took jobs in different areas. “So I tried to talk Abby into going into nursing,” Pero says laughing, but ultimately he’d take the plunge himself, starting the KCC Nursing Program this fall. Pero, 53, is no stranger to new starts. Originally from Allen Park, a suburb just west of Detroit, Pero joined the military a year out of high school and spent six years in the U.S. Navy, working as an electrician’s mate in the branch’s nuclear power program. He earned a liberal arts degree from Henry Ford Community College in the 1990s and worked for more than a decade for an alarm company working in the sale and design of burglar and fire alarms. A yoga enthusiast, he ultimately wound up starting his own yoga studio in Southgate – now a nonprofit called Yoga 4 Peace – and has taught yoga for 15 years. It was at a yoga retreat center up north that he met his wife; the two eventually moved to Kalamazoo to be near her family, and ultimately found themselves in Battle Creek. Pero says his background in yoga has helped him in the Nursing Program, particularly when it comes to anatomy, the biodynamics of the body and in speaking and working with people, something he’s comfortable with after all his years working with yoga students. Today, Pero’s goal is to finish the Nursing Program and then work in travel nursing for a while, getting a feel for where he’d like to work and in what area of nursing. And, presumably, to do some mountain biking while he’s at it. He also still teaches at the yoga studio in Southgate.